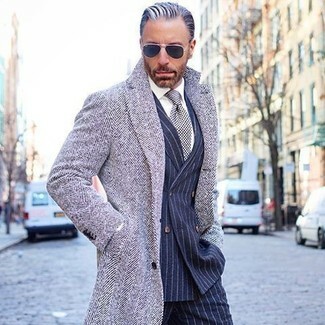 Team a grey herringbone overcoat with navy vertical striped dress pants for a sharp classy look. For a nothing less than incredibly stylish getup, try teaming an olive military jacket with navy vertical striped dress pants. As you can see here, looking casually classic doesn't take that much work. 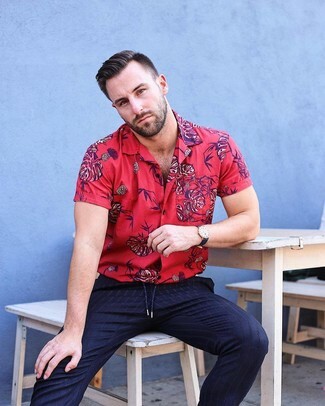 Just wear a red floral short sleeve shirt and Brunello Cucinelli navy vertical striped dress pants and be sure you'll look incredibly stylish. 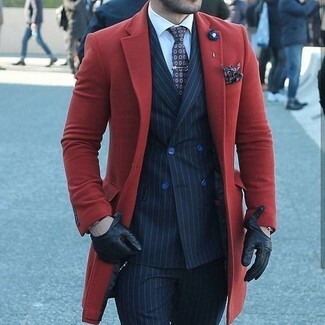 For a nothing less than incredibly stylish outfit, consider teaming a red overcoat with Brunello Cucinelli chalk stripe single pleat leisure pants navy from Bergdorf Goodman. Opt for a navy vertical striped blazer and Brunello Cucinelli chalk stripe single pleat leisure pants navy for a classic and refined silhouette. 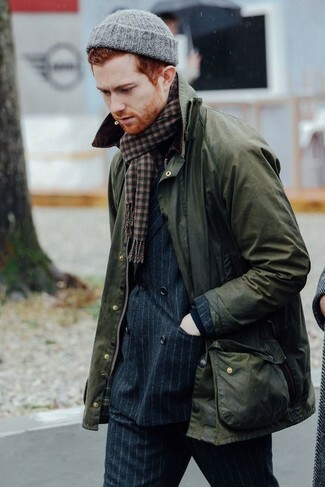 Consider pairing a brown duffle coat with Brunello Cucinelli chalk stripe single pleat leisure pants navy from Bergdorf Goodman for incredibly stylish attire. 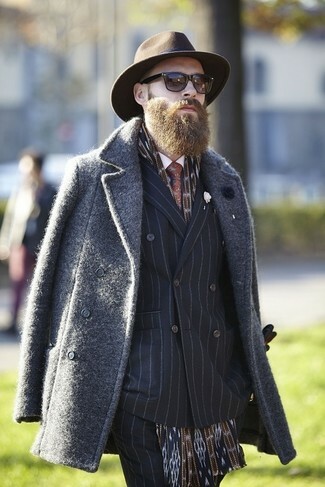 For something more on the daring side to complete this look, make dark brown suede derby shoes your footwear choice. 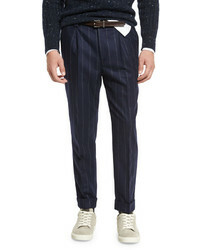 Reach for a charcoal overcoat and Brunello Cucinelli chalk stripe single pleat leisure pants navy from Bergdorf Goodman to ooze class and sophistication. 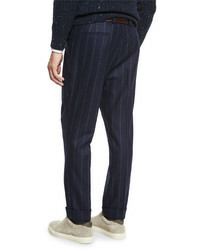 Try pairing a navy vertical striped double breasted blazer with Brunello Cucinelli chalk stripe single pleat leisure pants navy from Bergdorf Goodman for a sharp classy look. You could perhaps get a little creative in the footwear department and spruce up your look with burgundy leather oxford shoes. As you can see, outfiting sharp doesn't take that much time. 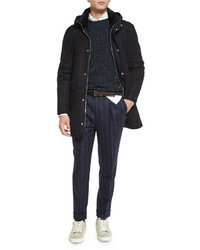 Just consider teaming a black leather biker jacket with Brunello Cucinelli chalk stripe single pleat leisure pants navy from Bergdorf Goodman and you'll look incredibly stylish. 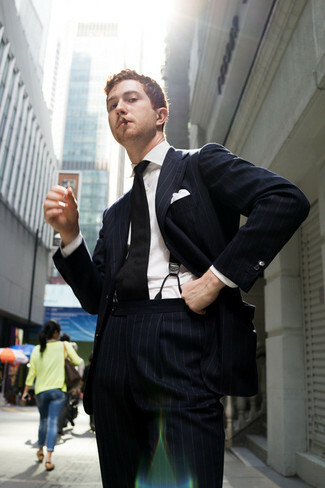 White leather derby shoes complement this look quite nicely.